Johnsonite TightLock Rubber Wall Base System provides a clean straight look for carpet and resilient tile. 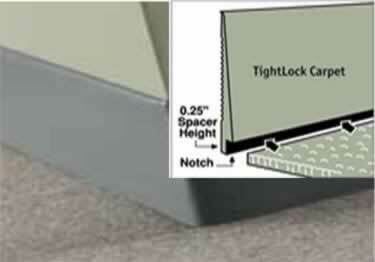 TightLock is a full 1/4' tapered thickness to hide damaged sheet rock and other wall imperfections. Available in 3 resilient and 3 carpet profiles. TightLock for carpet does not need to be removed when replacing carpet; simply remove the old carpet, and install the new carpet, the fibers can be tucked under the wedge shaped slope for a clean, finished appearance. Johnsonite TightLock® Rubber Wall Base System is provides a clean straight look for carpet and resilient tile. For resilient flooring, TightLock® offers a sealed cove base look with a more subtle radius. TightLock delivers a straight, clean look.